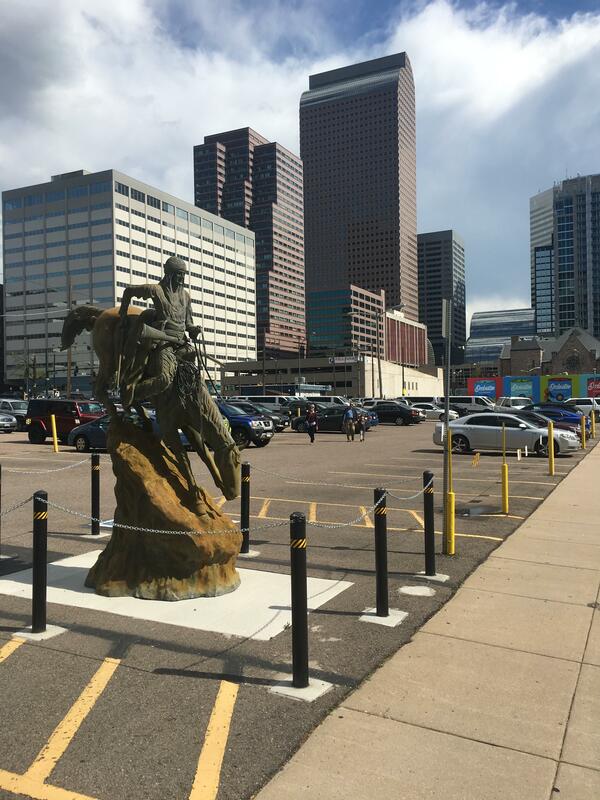 Why there's a Frederic Remington bronze sculpture in a Denver parking lot: A guide to pointless investigations - Denverite, the Denver site! This person is a fan of Western art, such as metal eagles on branches that one can place on one’s desk. Jun. 01, 2017, 2:39 p.m. The first twenty times I passed it, I assumed the statue on the side of Broadway had always been there, maybe even before the parking lot. Why would anyone put a man on horseback in the middle of a parking lot in 2017? In fact, the bronze appeared alongside the street just about a month ago. And, to cut to the chase, it was put there by a real-estate magnate whose eyes were just a bit bigger than his backyard. “It was very flattering that it got noticed and that someone’s actually asking about it, but we weren’t really looking for any publicity for it,” said Philip Schneidau, who works with the magnate in question and would prefer that nobody else email him about the horse. But that takes all the fun out of it. Here’s how I figured it out — much harder than you’d expect! — and also a guide to solving your own little Denver mysteries. If you just want answers, skip to the last section. When it comes to hyper-local oddities, your search-fu has got to be powerful. “Cowboy statue Broadway Denver,” might work for something more popular than a roadside bronze, but we need to use our clues to get specific. “Denver Remington sculpture,” for example, tells us that Denver Art Museum has a sizable Remington collection and a new Western exhibit. That’s promising. Still, no immediate links are evident. A search on reddit also found a lively discussion with several unproven theories. So, now let’s try getting a little less specific. When Google can’t give you an exact answer, you often need to search for a tightly defined category of items, then manually filter through the results. … and there it is. Our statue is “Mountain Man.” Life-sized replicas are sold online for $6,700. Never waste too much time internetting for things that someone could just tell you. My early theory was that this was a guerrilla marketing campaign for DAM, so I called their communications office. My general phone strategy is to quickly explain whatever stupid problem I’m trying to solve and then ask who would know the answer. I ended up speaking to Shannon Robb, who confirmed… that it wasn’t the museum’s. Also unfortunately, I couldn’t find a phone number for the parking lot in question. Once again, broaden your scope: There’s a car rental place just at the edge of the lot. That’s great — clerks and front-office workers keep close eyes on their surroundings. A quick call there put me in touch with an employee who will remain unnamed, because they’re not allowed to talk to the media. “We don’t know about it either. It just appeared one day,” this person told me. A crew had installed the platform “ages ago,” and then the statue itself suddenly appeared about a month ago. By the way: If you’re shy, just take a deep breath and make these calls anyway. Being on a pointless mission is actually a great excuse to talk to strangers. You’ll be fine. So, I obviously was getting closer, but this source just didn’t have the full story. That meant it was time to employ the sacred power of networking. If you have someone who knows half the stuff you need to know, ask them who might know the other half. In this case, my source was able to give me a phone number for the manager of the parking lot. I rang him up, introduced myself, and asked my question (“WTF statue?” basically) before he had a chance to worry about how I got his number..
“I don’t have no idea. The owner of the parking lot decided to have it in there. I’m not even sure what it is. I can’t help you with that,” said Abdi, who declined to give his last name. I prodded a bit more. Ask questions around the edges, try to trace the thread backward. Does this parking lot owner really love Remington? Did it just show up one day? Who is this mysterious property owner? That’s a question you can partially answer in Denver with the help of a handy city website. In this case, the records page says that the parking lot belongs to none other than “Ja Feel LLC” and “MOMCO LLC.” Love those names. The “chain of title” tab tells us these folks paid about $12 million for the lot back in 2012 — which I guess means they have money for Remingtons too. From there, head over to the Colorado Secretary of State, where you can look up most entities that do business in Colorado. The forms filed for LLCs generally don’t give away much information about the corporations or people behind them, but they do often list addresses. I found that the address listed for Ja Feel matched that of a Woodbridge Management in Texas. I called and ended up speaking to a receptionist. She calmly walked me through each detail of my request — my name, my number, the property, “OK, cowboy statue” — and put me in the system. Then I threw out a last line, emailing an attorney listed on one of the state forms and asking her to please convey to the property owners my interest in the horse. My trails went cold late on Wednesday. 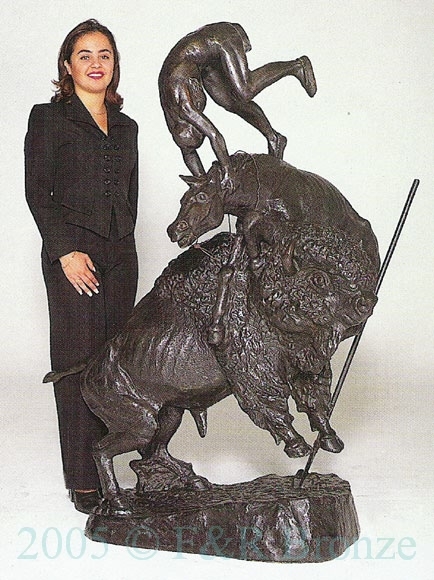 I was ready to simply chalk it up to the simplest explanation: A wealthy person likes Remington sculptures and wanted to share that with Denver. The attorney, however, came through with the final piece: She gave me Schneidau’s contact information. I got him on the phone this morning. He was hesitant to be identified in this article, saying it’s a fairly private business, but he was a good sport and went on the record anyway. His explanation: “We’re a private real estate company, and we own commercial real estate properties in several cities,” he said. He declined to disclose the identity of the statue buyer, but said this person is a fan of Western art, such as metal eagles on branches that one can place on one’s desk. Finding nowhere to put the statue, the owner thought he might put it on one of the company’s properties. They looked at New York, which would be close to the statue’s former location in the northeast, but that just seemed inappropriate. “To put it in a New York property — it’s called Mountain Man,” Schneidau said. Eventually, they settled on the parking lot on Denver’s Broadway. They also had to “plow through some paperwork” with the city. That took about a year, he said, though it wasn’t exactly anyone’s top priority. “We said, ‘You know, this is the right place. We’re going to hang tough,'” Schneidau said. They may have given up a parking spot for the statue, he acknowledged — “but to us, that’s not a huge sacrifice.” It’s for the culture. While I had him, I asked about the future of the parking lot. After all, acreage on Broadway can get some good money. For now, he said, they’re “happy with the parking investment.” They never expected any recognition for their horse, but they were flattered, he said, that I had taken the time to track them down. Total time investment: 3 hours. Was it worth it? Too late to question that now. At least I made someone feel special.